In a time when current demands need to be supplied and plans need to be made for a future that we don’t know when (or if) it will come, the job of cities, planners and design-builders becomes very, very steep. The fact is, we currently live in a car-centered society and are uncertain about how or when a different type of society may be attained; so how do we efficiently deal with the NOW while we “pave” the way for the THEN? Although widely used in Asia, the Middle East and Europe, in the U.S. and other parts of the world Automated Parking Systems are not a fully adopted technology. Architects, developers and planners are still in the process of becoming familiar with the concept; however, more than ever before, the times are pressing for innovative solutions to embrace the challenges of today and plan for those of tomorrow. Let’s take a closer look at what APS have to offer. No matter what side you are on in the conversations, everybody seems to agree that parking is taking up way too much valuable land and creating blight in our cities. Concrete ramps garages and surface lots are often referred to as “islands” and “craters” that disrupt the flow of architecture and make it difficult for pedestrians to navigate the urban landscape. APS can also become a valuable tool for development and redevelopment projects, especially in downtowns where lands is scarce and scattered. APS give the opportunity to developers, city planners, and CRAs (Community Redevelopment Agencies) to work with smaller lots, distributed all around dense centers. Smaller and better distributed parking facilities may reduce traffic, as drivers will disperse in different directions depending on their ultimate destinations, instead of driving to two or three central locations all at the same time during peak hours. Distributing traffic translates into less traffic: win-win. 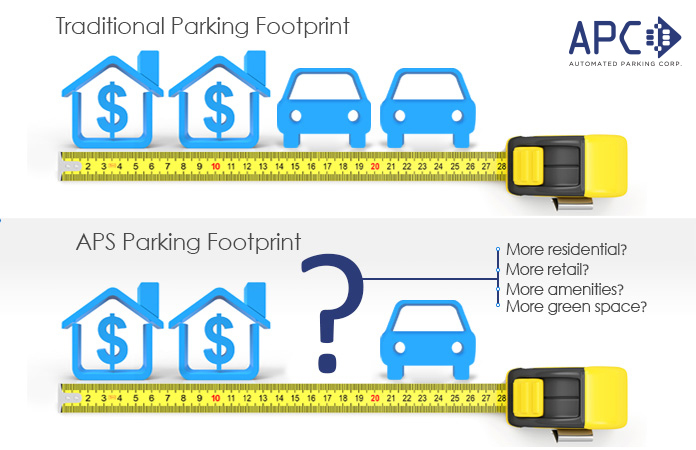 While we work to adjust, modify or altogether change parking requirement regulations, APS offer a viable solution to bridge the gap between better land use and parking compliance. What would you build in the 50% to 70% cubic space that will not longer be devoted to parking? The land savings not only translate into more relevant development (more housing, commercial, amenities, green or public spaces) but also save money in acquisition and the cost of building parking. You know it: win-win. 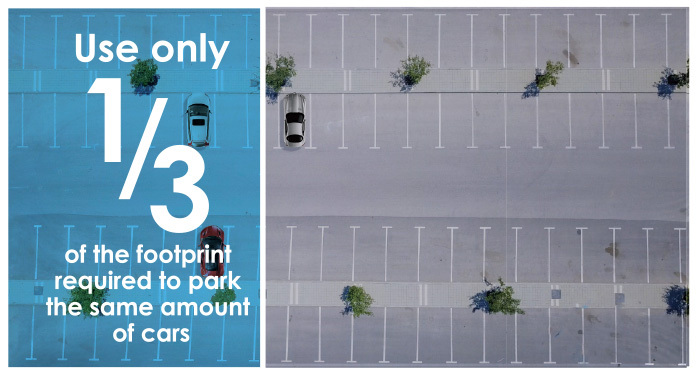 Other sensitive subjects surrounding parking include pollution, heat island effect and impervious surfaces. A study published by the National Parking Association in 2009 shows that, in addition to saving 3,500 gallons of gas a year, Automated Parking Garages or Systems also reduce vehicle emissions (such as Carbon and Nitrogen Dioxide) by 83%, volatile organic compounds by 68% and Carbon Monoxide by 77%. Automated Parking Structures can also be repurposed in the future, and, because they are steel buildings, they are also a lot easier to put together, tear apart when no longer needed or relocated to other sites. They can also be “recycled”, cause, after all, they are all comprised of metal parts. Built today to supply demand, reused or recycle tomorrow… Yes, win-win. In sum, most people don’t even understand how complex this subject is and the myriad of variables, projections and forecasts involved in city planning. It’s very easy to talk about a carless or driverless future and about a future without parking facilities, but we surely need to give planning and design-build professionals a break when it comes to gauging how to deal with the demands of today and still plan for the ever-changing and uncertain forecasts of tomorrow; Automated Parking Systems may be the tool they need to gap that bridge. The answer is in the facts.